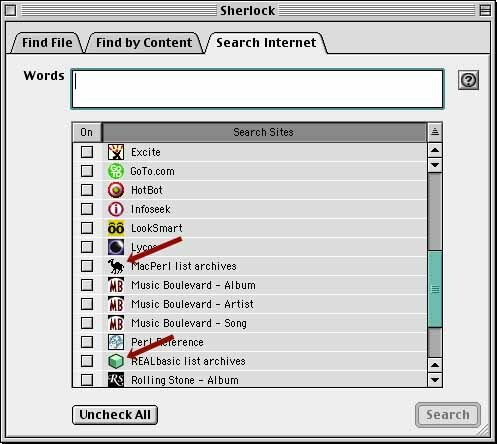 Sherlock is a handy technology built into the Mac OS Find utility since Mac OS 8.5. As you're likely already aware, it lets you send queries to one or more Web-based search engines without first bothering to fire up a Web browser. 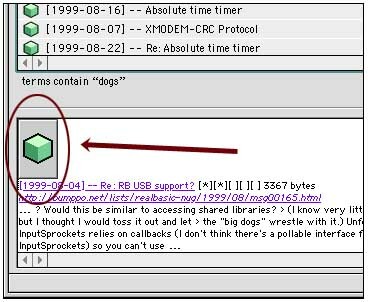 Bumppo.net offers Sherlock plugins for both our REALbasic and MacPerl list archives collections. Each plugin searches all lists within their family. The bumppo.net plugins include in their results the date of a given message in the Name field. This means you can sort the responses either by relevance (the default) or by date, by clicking on the header row. Many people don't realize that this little graphic here is actually a useful button. If you click on it, it'll launch your default browser, and take you to the web-based search results for the same query. This is handy when you want to elaborate on a search with options that Sherlock does not provide, such as complementary ("or") matches. Sherlock will return no more than 30 responses to a given query. If you get 30 responses, chances are the server returned many more than that, and Sherlock quit paying attention after the first 30. If you want to see more than that, you can change the number of responses which Sherlock will display, by opening up the plugin file in a text editor such as BBEdit, Alpha, or Tex-Edit Plus. so that the value reflects the maximum number of matches you want to retrieve. If you set this to a very large value, you may want to increase Sherlock's memory allocation. Questions, comments, feedback, suggestions to archives@bumppo.net. thanks!